Matt Wahl – Fun Songs About Good Stuff! When you visit Matt Wahl’s website you will first see the words “Music Is Fun!”, a sentiment that is clearly a part of all of his music. Fun. Like beers with a friend, a day at the beach, a fantasy about being a rock ‘n’ roll star and stories about your buddy who always does something dumb when he’s had a few drinks. 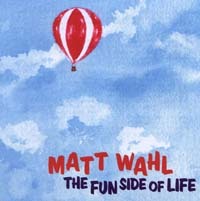 Matt’s latest album “The Fun Side of Life” is filled with fun and true stories about life. The album starts with the song “Lighten Up”, an upbeat tune which perfectly sets the mood of the album. “Lighten Up” is followed by the song “The Answer is Faith”, one of the strongest tracks on the album which features a nice driving piano line and some great guitar work. “A Fun Song About Good Stuff” shows a little of Matt’s country side with a song that is perfectly described by it’s title. With “Another Place, Another Time” and “I Never Took the Time” we hear the slower side of Matt. Both make me think of Jim Croche’s slower songs. The sound is echoed in “A Brilliant Song” where Matt pokes fun at the “metaphorical nonsense” that runs rampant in popular music. “Hold My Beer…Watch This!” is a fun romp through indiscretion. With a very catchy tune this song is an ode to the most common last words spoken in Matt’s native Wisconsin. This is the most fun song on “The Fun Side of Life” and will… repeat will get stuck in your head after the first listening. “The Fun Side of Life” closes with the title track, a nice ballad of what we all want from life. No worries, no competition, loving our jobs, having a good time; call it idyllic, but this song is about what we are all looking for. “The Fun Side of Life” will take you back to the best times you’ve had and remind you how important it is to have more of them. Some might consider Matt Wahl’s lyrics too simple, even pedestrian, I prefer accessible. No fancy over-your-head language or double meaning, just fun, true words about the world we live in. Matt follows in the tradition of Jimmy Buffett, Jim Croche and Gordon Lightfoot by offering what I would consider modern “folk music”. Music for and about people…real people. For the complete track list and generous samples from “The Fun Side of Life” check out Matt’s CD page. The Fun Side of Life is available from CD Baby and also available on iTunes. If you like it I highly recommend checking out Matt’s other albums.